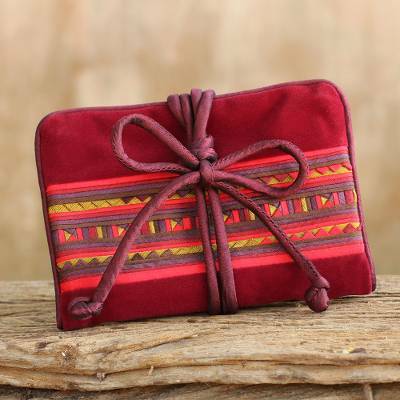 Thai Hill Tribe Crafted Burgundy Cotton Blend Jewelry Roll, "Tribal Jewels"
Classic Lisu textile patterns recall the grandeur of Thailand's tribal artistry in a hand-sewn jewelry roll. Designed for maximum practicality, the cotton blend case features a velvet interior with a long pocket, plus two smaller ones with a zipper closure. From Thai Tribal Crafts, the jewelry roll includes a ring bar with a press-snap fastener. You can find cotton blend jewelry roll 'Tribal Jewels' by Thai Tribal Crafts in jewelry boxes categories such as Hill Tribe Rolls, Polyester Rolls and Cotton Rolls. Enjoy exploring these sections for other Novica treasures. "Quality sewing and fabrics in a unique design!" Tribal Jewels-Silk jewelry roll in cherry red velvet and silk is beautiful and very functional. It folds out flat and the 2 zippers open up 2 compartments which are large enough to hold bracelets, necklaces and earrings. The center roll can be used for rings or hoop earrings. It is small enough to put in my purse so I don't have to pack my jewelry when I travel. It is versatile and could be used as a purse also. The intricate pattern is lovely and the workmanship is outstanding. This is a great gift. This is beautifully made! My daughter-in-law will love it! Something I am proud to own and use (as a jewelry case for travel). My only suggestion would be to make it slightly larger, if this is possible. "Now I need another one"
This handmade item is absolutely perfect with fine materials and attention to detail. I bought this for myself but now am considering purchasing another as a gift. 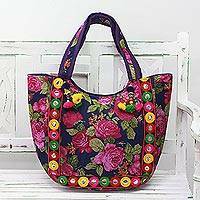 "VERY, VERY nice jewelry bag"
I love that this little jewelry tote is pretty and practical. I ordered another one. I love this little jewelry roll. It is perfect for a compact way to bring some key pieces when traveling. I have purchased these as gifts while ordering one for me. They come in pretty colors to suit everyone's taste. "travel help with jewelry and other small useful it"
Perfect for carrying jewelry for travel.